22 April - 2 October. 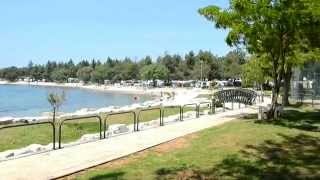 Camping Valkanela is located in a beautiful green bay, right on the Adriatic Sea, between the villages of Vrsar and Funtana. It offers 1,771 touring pitches, all with 10A electricity. Pitches near the beach are numbered, have shade from mature trees and are slightly sloping towards the sea. Those towards the back of the site are on open fields without much shade and are not marked or numbered. Unfortunately, the number of pitches has increased dramatically over the years, many are occupied by seasonal campers and statics of every description and these parts of the site are not very attractive. Most numbered pitches have water points close by, but the back pitches have to go to the toilet blocks for water. Access roads are gravel. 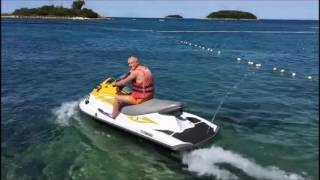 For those who like activity, Valkanela has four gravel tennis courts, beach volleyball and opportunities for diving, water-skiing and boat rental. 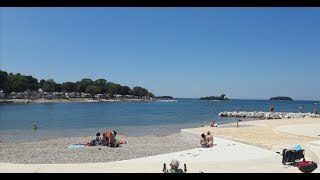 There is a little marina for mooring small boats and a long rock and pebble private beach with some grass lawns for sunbathing. It is a short stroll to the surrounding villages with their bars, restaurants and shops. There may be some noise nuisance from the disco outside the entrance and during high season the site can become very crowded. Fifteen toilet blocks of varying styles and ages provide toilets, open style washbasins and controllable hot showers. Child size toilets, washbasins and showers. Bathroom (free). Facilities for disabled visitors. Laundry with sinks and washing machines. Dog showers. Two supermarkets. Fish market (08.00-14.00). Souvenir shops and newspaper kiosk. Bars and restaurants with dance floor and stage (22/4-2/10). Pâtisserie. Tennis. Minigolf. Fishing (with permit). Bicycle hire. Games room. Marina with boat launching. Boat and pedalo hire. Disco outside entrance. Daily entertainment programme for children up to 12 yrs. Excursions organised. Two dedicated dog areas. WiFi on part of site (free). Site is 2 km. north of Vrsar. Follow campsite signs from Vrsar.